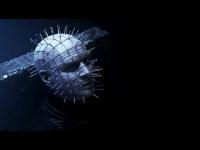 Gary J. Tunnicliffe"s Hellraiser: Judgment (2017) has some a lot set on this film, can it revive the Hellraiser franchise? Judging by some of the earlier promo material and my hopes that they can bring back the series to its former gory glory, I cannot wait to see how this new Hellraiser film turns out. Heather Langenkamp, Randy Wayne, and Rheagan Wallace star in Hellraiser: Judgment.